This section will cover topics related to creating and managing your Knack account. In order to create your online database or web application you will first need to create a Knack account. Visit our signup page and complete the account registration form here. Password: must be at least 6 characters. Account: a short name to use for your Knack URL where you can access your Knack apps. App Name: the name of the first app you want to build. Note: The account URL must be unique. An account will not be created without all of the required information. Knack Tip: Once your account is created you can change your URL at any time in your account settings. Once the signup form is submitted your Knack account will be created with a single blank app with the App Name you provided. 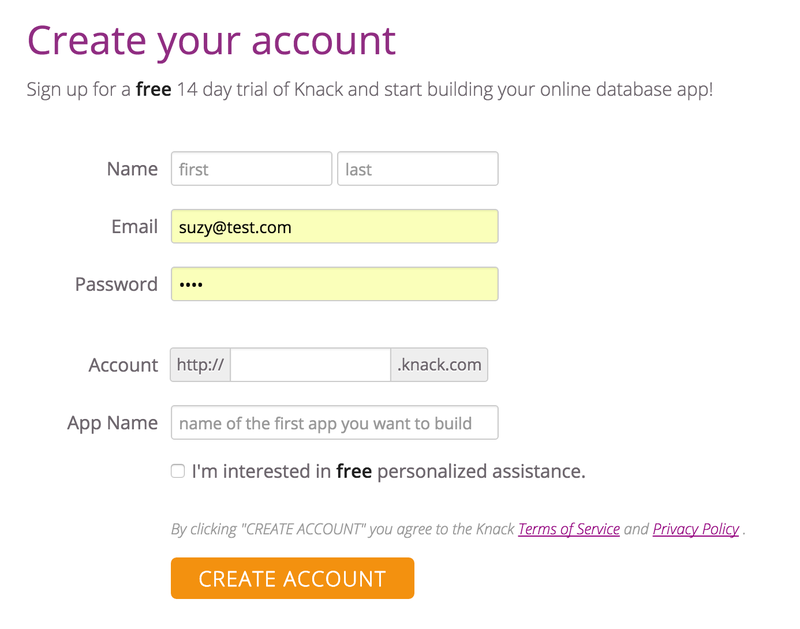 Knack offers a 14-day free trial period for you to explore and become familiar with the Knack online database platform. No credit card is required during this trial period. While the free trial offers a wide range of features for you to explore there are a few limitations. Shared Builders - unavailable during the trial. Maps & Geo-Location - available during the trial but require a Pro plan or above to continue using. E-Commerce - available in test mode only. Scheduled Tasks - unavailable during the trial. Record History - unavailable during the trial. IP Blocking - unavailable during the trial. SSO - unavailable during the trial. Custom Domains - unavailable during the trial. Import Size Limits - limited to 10,000 records across all objects and apps. Additionally, your CSV cannot be any larger than 250 MB. Note: Trial accounts are deleted 90 days after the date you signed up for the trial so it is important to upgrade your account prior to this deadline. Upon the completion of the trial you will need to purchase a plan in order to continue to use your database. Your credit card will be charged at the end of the trial period and will be charged monthly/annually going forward. Can I sell apps that I create with Knack? Absolutely. Many customers create custom apps for their clients or charge users to access the apps they build. In your account dashboard you can use the "Delete Account" option which will close and completely remove your account. This cannot be undone. There is an option to freeze or pause your account one time annually at a deeply reduced monthly rate. You will not have access to your apps while accounts are "frozen." You may pay with a check if you intend to purchase any Annual Corporate or Enterprise subscription. A request must be made and an invoice will be issued prior to the account becoming active. How do I copy my app to another account? You must make a formal request to transfer your app. The account holder must have an account in good standing and authorize the transfer. You can find more details about copying apps here. How do we gain access to a company account that a former employee created? In order to gain access to a company account you must first attempt a password reset using the company email address. If this is not feasible, you must provide the last 4 digits of credit card on file, the expiration date, and the security code to verify your company is the account owner. Knack apps and data are backed up on a regular basis. These backups can be used to restore accidentally deleted objects, records, fields when needed. As an example, on a Starter plan, a version history taken at 3:00 PM on Wednesday will no longer be available after 3:01 PM 14 days later. Note that if you upgrade your plan, the data is only retained on the previous plan's policy; there isn't a way to retroactively obtain records history that has already been removed due to the prior plan. For example, if a Starter plan customer upgrades at week 3, they’re not able to access week 1 of data history since that’s already been removed with their prior plan policy. Backed up daily at 8am GMT. Retained for 7 days before they're overwritten. Meaning that this Wednesday’s backup will overwrite last Wednesday’s. Restoring the previous Wednesday’s data is not possible after it is overwritten. Backed up every 12 hours at 7am and 7pm GMT. Retained for 7 days before they’re overwritten. We also make a weekly backup of the app structure every Friday and keep that for a year. These can be used to restore an app that may be outside of the normal 7 day cycle. Restoring an app that was deleted more than 7 days ago will not have records to restore. Note: Backup restores are included in our HIPAA plans for no charge. However, it is important to note that your data, including backups, are removed 28 days after deletion from your app. If the alteration occurred after this timeframe, we would not have a backup available to restore your data from. Upon request, database records and/or app structure restoration can be fulfilled provided the record history or schema backup is still available, based on the retention policies as outlined above. Restoring records and apps normally take 1-3 hours of manual work, however, the processing time to complete the full restore can take longer than that. The fee to restore database records and/or application structure is $100/hr. for accounts on the Starter and Pro Plans. Restoration is included for Corporate and Plus Plans. Restoring is not an option during a trial. Contact support@knack.com via email or login to the Knack help desk to make a request. Customer Support will confirm your request and outline next steps in the restoration process. Authorization will be requested to charge your Knack account $100 for the first hour (there is a one hour minimum charge). Once payment is successful, the restoration process will begin. You will be alerted when the process has completed and the balance due will be processed on your account. You are only charged for the time to prepare the restore, not for the time the system must process the restore. Confirm the state of your restore.